Photo via PAA – Central Facebook page. Earlier this month, the RestoreCore team had the privilege of attending the Central Pennsylvania Apartment Association’s 2017 Best of Living Awards. 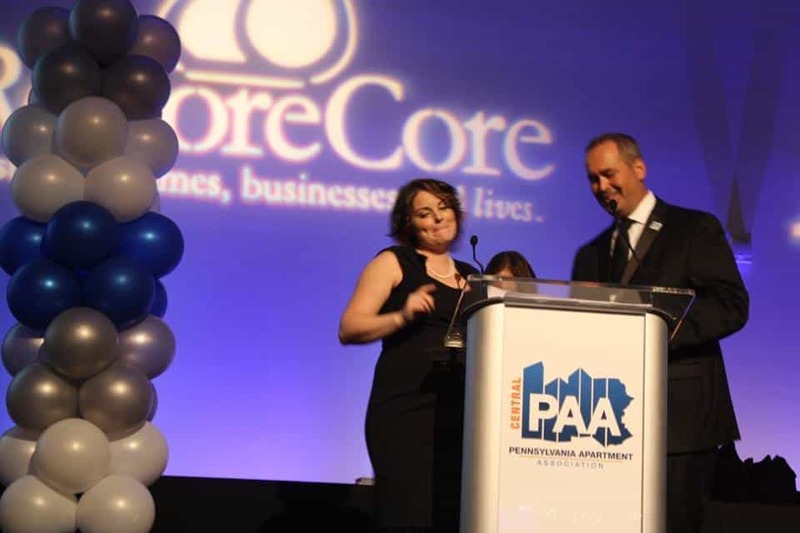 RestoreCore is proud to support and partner with PAA-Central and our multi-family colleagues year-round. This specific event highlights those in the multifamily community who are excelling in their industry. The Best of Living Award allows those in the apartment industry to show the public and peers that each community offers the physical qualities, marketing achievements, and management caliber of an award-winning property. RestoreCore was proud to be recognized as a platinum sponsor for this wonderful event. Next month we have the honor of attending the New Jersey Apartment Association’s Garden State Awards of Excellence which will recognize those properties and companies in New Jersey’s multifamily industry. For 24 years, this NJAA event has been bringing the best of the industry together to honor those who are exceedingly dedicated to their craft. RestoreCore has memberships and strong associations with organizations across the multifamily industry and values these integral relationships. We’re honored to employ those that serve as board members and committee members on some of these organizations’ committees. The members consist of a lot of our customers in the industry and/or vendors. As a restoration company in PA and NJ, we work very closely with everyone, so we make it a point every year to celebrate the success of our peers and the fantastic, hard work everyone puts in to making the apartment world a great place to do business throughout our region. For five generations, we’ve served Pennsylvania, New Jersey, Delaware, and Maryland and pride ourselves on quality, professionalism, safety and teamwork. Being able to support those in the industry who are also committed to these values is one of the most exceptional things about what we do. Contact RestoreCore to learn how we can support your multifamily property and team.